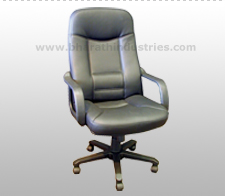 We are one of the major Manufacturers and Suppliers of Office Chairs in different types like leather, fabric, sleek and mesh which is placed in Coimbatore, TN. We have a wide range of designs in the office chairs category. Check the office chair models that suit each room before finalizing a design. With us you will get good quality products at competitive rates. Step by step analysis of the office seating arrangements allows in choosing the best type of Office chair.